You are trapped in a hole with three maniacal murderers. You have a shotgun but you only have 2 cartridges. How do you shoot them all? It is a SHOTGUN. It shoots multiple bullets at a time. You should know what to do from there. Long and slinky like a trout, never sings till it's guts come out. Alan fires a bullet from his hand gun and his friend Wade catches the bullet with his bare hands. The gun shoots actual, deadly bullets. The bullet does not touch anything but air after it leaves the gun and until it reaches Wades hand. Wade is uninjured. How does he do it? 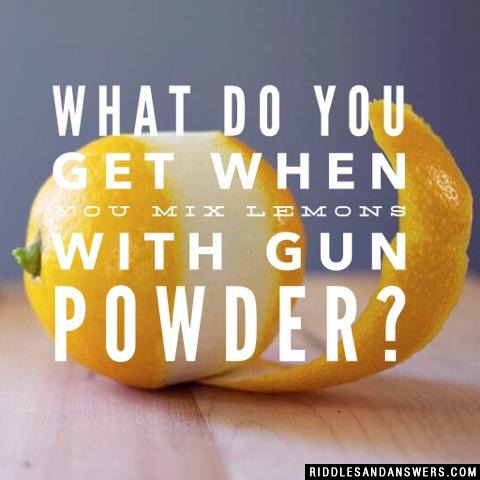 Can you come up with a cool, funny or clever Gun Riddles of your own? Post it below (without the answer) to see if you can stump our users.